With 1Password Business, owners and administrators can view the Activity Log. Other team members can also view the Activity Log if they belong to a group that has the View Administrative Sidebar permission. Sign in to your account on 1Password.com and click Activity Log in the sidebar to get started. Activity. The type of action and the names of any team members, vaults, or groups involved. 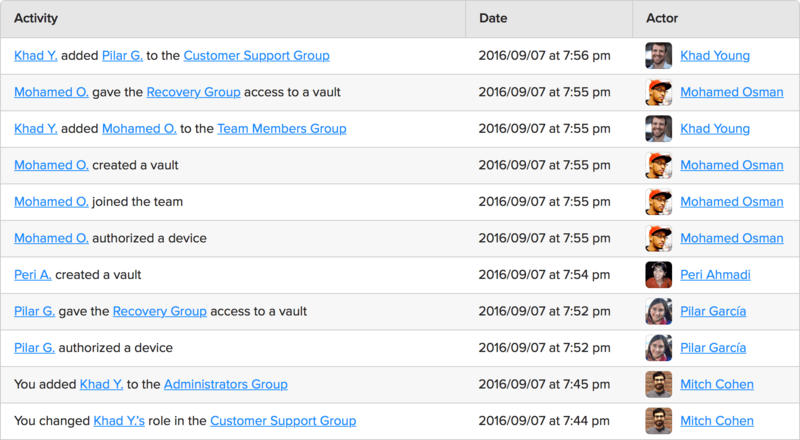 Click a team member, vault, or group to view its details page which includes its activities. Date. When the action was performed. Actor. The team member who performed the action. Click to view their details page which includes their activities. To only view actions performed on a specific date, click Jump to Date and select a date. To only view certain types of actions, click Filter by Type, select one or more actions, and click Done. If none are selected, all types of actions will be listed. To only view actions performed by a certain team member, click Filter by Actor and select the team member. To remove a filter, click next to its name. Users. Inviting, joining, and confirming. Groups. Creating and deleting, adding and removing team members, changing roles, and updating group details. User Access. Adding and removing access to vaults. Group Access. Adding and removing access to vaults. Vault Items. Updating (creating, editing, and deleting items, and emptying the Trash). Invitations. Inviting team members and guests. Devices. Authorizing and removing devices. Account Changes. Updating (changing team settings) and confirming. Email Changes. Beginning and completing email changes for team members. File Uploads. Creating (adding documents). Billing. Adding and removing credit cards, updating subscriptions.